Good morning and I hope this finds all of you doing just great. Well, ole’ Deb and I have had a busy today, and looks as if we might be busy again tomorrow, too. Our garden is really putting out the produce now, and our canner is running pretty hard. First though, I have to give Deb a hand this morning for such a fine supper last night. I was piddling around out in the garden when she hollered, “It’s ready!” At my age anymore, many things don’t get me too excited, but those two words still do, and it looks as if they always will! They simply mean that it’s time for you to wash up, cause the vittles are being laid out on the table, and again at my age, there ain’t many things much more exciting than that! Now Deb can cook, and when she lays out a spread, you can count on everything being really good. Yesterday was no exception. It wasn’t a big meal, but it was a GOOD meal. I washed up and sat down to some sliced tomatoes right off the vine, fried eggplant right of the bush, a big mess of peas we’d canned out of last fall’s pea patch, and pork chops. She’s been marinating chicken for a long time in lemon juice for 24 hours, and man it’s great. When we went down to the ranch, we grilled some chicken breasts that she’d marinated, and salted and peppered up. My brother and his wife Patty ate with us, and as soon as they tasted the chicken, they immediately asked how we had flavored it. Deb just told them to marinate it in lemon juice. Both said they’d start, because of the flavor. Honestly, it is good done this way. Last night, though she marinated those pork chops in lemon, and I really liked the taste. She cooked them on the George Foreman, and those chops with the vegetables she had were just really good. She only marinated the chops for about an hour. We canned 15 more pints of tomatoes this morning. They’re coming in fast now. We gave Mom and Dad a bunch last Saturday and some eggplants. Mom called last week and told us how much they enjoyed them. Dad usually plants several tomato plants, 20-25 every year, but for some reason they didn’t do it this time. Maybe because he knows he can always come down here and “lift him a few?” Hmmmm. But they’re wishing now that they had planted a few anyway. They both get around great, but now are beginning to show their age, but Dad seems to be aging a little faster now. At least more so than Mom. But he’s in great shape for his age, and loves to get outside and work. Shoot, he works in the orange grove 5-6 days a week! Anyway, they took some green tomatoes home with them too, and Mom said they were delicious. We all firmly believe a person doesn’t like a dern fried green tomato, then there’s just got to be something wrong with them! But the way the tomatoes are coming in, there’s just no way we can keep up with them. We’ve told a couple of the neighbors to come and get some, but as of yet, nobody’s showed. GOOD! No, they’re free to come get some, but I swear I think they want us to pick ‘em and deliver em! WRONG! Shoot, I don’t even bring Deb’s share up to the house, I mean…she knows where they’re at! LOL! With the 15 pints we canned today, that gives us 35 pints put up so far, and again, those jewels are just really starting to come in good. If the raised bed maters hadn’t gotten Fusarium Wilt, we would have been covered up! Well, we put up some bread and butter pickles today as well. We put up 10 quarts of them. We used my Granny Margaret’s recipe. That thing’s been around since before “ole Blood & Guts” was whippin’ Monty to every town them dern Nazi’s was a holdin’! But boy they’re good, ah yes! 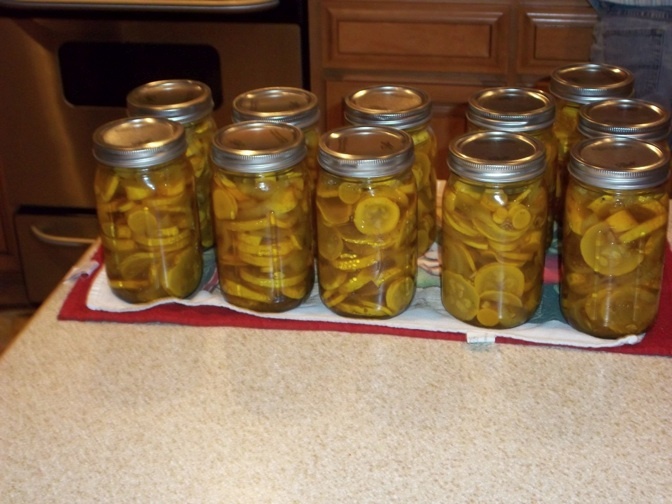 While we were canning the pickles, we canned 11 quarts of squash pickles. I did them almost the exact same way as the bread and butter…same recipe. I’m sure those pots were glad to get washed out and put back up this evening. They cooked most all day long. I tell you too, those two knives Deb and I use, cut up some tomatoes, squash, cucumbers and Vidalia onions today. But the end result is well worth the time spent. Plus we enjoy doing it as well. I’m sure if we did this day in and day out, every day. Well, that might shine a different light on canning altogether, but like we do it, it is enjoyable. I tell you what, let’s talk a little on how Deb and I put these pickles up, okay? You combine all ingredients. Stir well. I start off with my stove setting on 8, and just let everything start heating up. Granny says to not let it come to a boil, but simmer. While it’s heating, I’m stirring fairly often, just to make sure everything is mixed well, and no sticking. You’ll tell it’s getting hot, and just keep on watching them. You’ll begin to see the cucumbers just beginning to change color from their dark green to barely beginning to yellow, ever so slightly. I then turn the stove off, and start putting them into quart mason jars, that have been pre-heated. We fill the jars, Deb wipes down the jar rim for me, and we put on the lid and rings. Most stop here, as the hot liquid will seal your lids, but I go one step further. I have a big deep pot on another burner on high. By now, this water is boiling. I then place the quart mason jars into this boiling water, and hot-water bathe them for 8 minutes. My pot isn’t deep enough to cover the lids with water, but it does get up to the lid. This is fine because all I’m doing, and its personal preference, is insuring my jar lids seal. That’s all. Now these I do only a little different, but the recipe is the same, for mine anyway. Once I cut up the squash, and onions, I put them into the pot I plan on cooking them in. I then add my ¼ cup of salt, and toss them well. I let the squash, salt, and onions sit for 1 hour. Then I put them on the stove, and add everything we used in the bread and butter pickles. These I do bring to a boil. Once they come to a boil, I let them cook for 4-5 minutes, turn them off, and start jarring them up. Do just as you did the cucumber pickles, once jarred, I then hot-water bathe these too, for 8 minutes. Many of you may not like the squash pickles, and I don’t know why I made this statement, but maybe its because Mom and Dad for example, wouldn’t touch them with a ten foot pole. BUT, they don’t particularly like squash period, and I can’t understand that? Personal preference once again. Honestly, I believe you could put up dog fennel stalks this way, and I’d eat em! But I like bread and butter recipes, period. I wish all you good people a very good day today, and hope all of you are doing outstanding! This entry was posted in Covering the Bases. Bookmark the permalink. I am anxious to try your pickle recipe , however, I have a couple of questions. You have 5 cups of sugar written twice ,,,,Is this a type error? Also how long after they go into the jars before you can eat them? Thank you. I have never done this before. Good eyes Rena! In regards to the amount of sugar, it is only 5 cups. It is a typo, and should have been listed as part of the ingredients only once. My mistake…sorry! You know honestly, we’ve never let them sit for any length of time. A week, two weeks, a month, just whenever we ran out, we’d open the next jar. I know that there are recipes that call for this, “a sit period,” but these aren’t. This, plus the fact my bunch has never been one to let ANY type of food product have too much of a break period. That’s why we got it…to eat it, not look at it! LOL! Thanks for letting us know that Deb had screwed up! Not really, this one was all me! 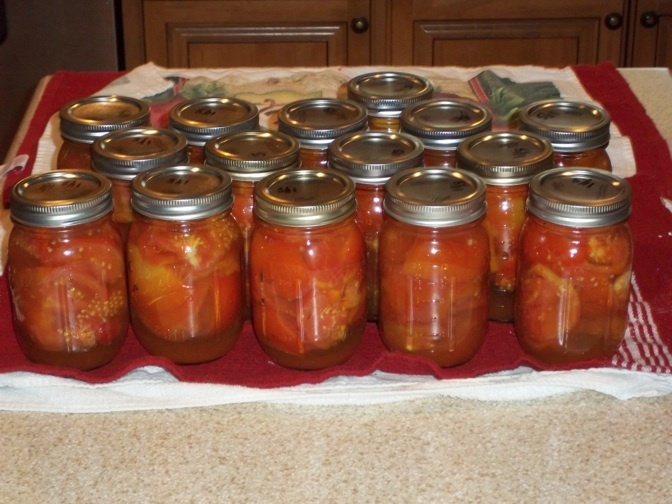 WONDERFUL green tomato pickles recipe from my mom. A little time consuming but well worth the results. 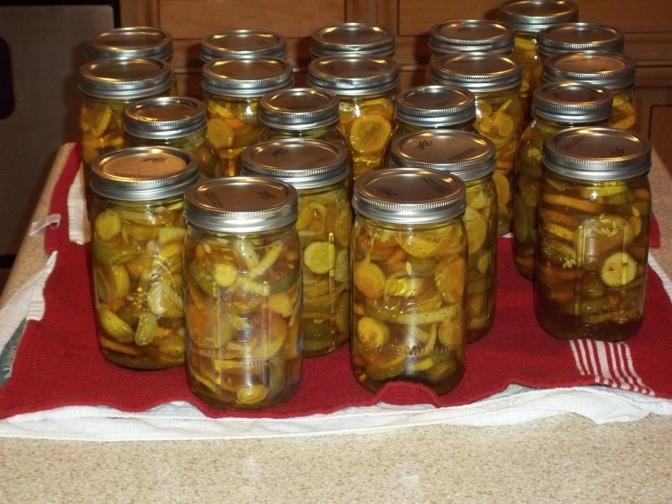 I also use this recipe for squash and cucumber pickles. They are very good also but to me nothing beats green tomatoes. 1 – Soak tomatoes in the lime water for about 24 hrs. Remove from lime water and soak in clear water 4 hours. change the water hourly. Oh my gosh……..it grouped the recipe when I posted it. If you have a problem understanding let me know.